Even as a lighter Dark Autumn, lip gloss isn’t a product I’ve had much luck finding. Most of the ones on the market don’t have enough pigment for me to wear on their own, and just simply putting a clear gloss on top generally leads to the color underneath pulling too pink or just losing its necessary depth. A lot of dark seasons favor mattes, but I like my lip products to feel like a balm and I don’t think that matte is the most flattering finish for my particular lip shape. I don’t like to admit it, but I think we’ve all bought a makeup or skincare product after seeing one of those YouTube “guru” put it in their favorites or use it in a tutorial. When I saw the new Coco Rouge Moisturizing Glossimer, it seemed like an answer to my Dark Autumn prayers. An opaque lip gloss that feels like a balm?! Where have you been all my life?! 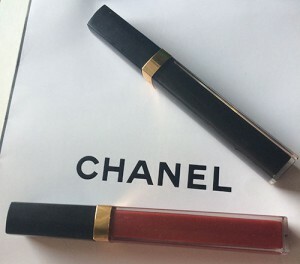 Chanel describes their new gloss formula as “a non-sticky, ultra-light formula leaves lips visibly smooth and plump, and perfectly brilliant. An innovative, dual-sided applicator ensures optimal, even coverage and high precision. In 24 shades to collect, layer and love. Enriched with Coconut Oil, Peptides and Vitamin E, along with an exclusive Hydraboost Complex, to offer hours of comfort and moisture.” It really does feel like a balm and it looks great, and comes in a wide range of colors with several different finishes (sheer, opaque, semi-opaque). You can see a breakdown of all the shades here, although I have to say that the shade I have (Opulence) looks more like it does on the swatch on the Chanel website than it does the one on the blog post. I went with Opulence because, while there are colors that seem darker (Decadent, blackberry, and Epique, oxblood), Opulence (described as cranberry) is warmer. I might get Epique at a later date, but to start, I wanted a color that would make a good everyday color for me. I did end up getting two, because it was just one of those weeks where you stand in front of the Chanel counter and say, “Screw it. This is a two lip gloss kind of week.” I ended up getting Caviar, which is a limited-edition transforming topcoat. This is something that is really handy for both Dark Autumns and Dark Winters. It’s a sheer black lip gloss meant to deepen the color of whatever lipstick you’re wearing underneath, which solves the problem of lip glosses making lipsticks lose their depth. (They also have an orange one for warmth and a gold for brightness, for True warms and Brights). 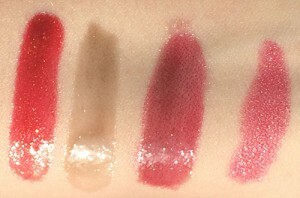 I swatched them, and then used Caviar on top of MAC’s All Out Gorgeous. So if you’re a Dark Autumn or a Dark Winter and you struggle to find lip glosses that retain their depth, I suggest checking these out, and if you can only get one, pick up Caviar while it’s still available so you can use it with all your other lipsticks. There are colors for other seasons too, of course, but I’ve never found glosses that work so well for Dark Autumn before.